Among the best Lunch Menus in DeLand. At your request, sandwiches and most entrees can be easily prepared Vegan or Vegetarian. Grilled steak on a bed of fresh spring mix and romaine, tossed with carrots, zucchini, cucumber, and red onion. Sprinkled with sun dried tomatoes with a sweet, creamy avocado dressing drizzled on top. Grilled chicken over fresh spring mix, romaine, carrots, cucumber, and red bell peppers. Sprinkled with quinoa and dried cranberries, drizzled with pesto and balsamic vinaigrette. Half Order 5.95, Homemade empanadas stuffed with your choice of chorizo, chicken, or cheese topped with our homemade chile con queso sauce. Half Order 8.95, Fresh avocado filled with lime infused shrimp and red onion, then covered in a delicate citrus glaze and topped with fresh cilantro. Half order 5.95, Mix of rice, mozzarella cheese and tender chicken formed into four balls over a bed of mole sauce, topped with a bit of cilantro. Half Order 6.95, Small filet of fish paired with our finest herbs in union with an insatiable blend of red onions, grilled zucchini, garlic and pineapple that rest atop a bed of refried black bean spread. Cooked inside a corn husk for maximum flavor. Half Order 8.95, Fresh avocados filled with Chef Nora’s red, black and garbanzo bean salad infused with a unique tangy vinaigrette. Half Order 7.95, Arepas topped with shredded pork carnitas and spring mix, drizzled with creamy avocado dressing with a sprinkle of sun dried tomatoes and fresh queso blanco. Half order $6.95, Delicious cornmeal patties topped with chorizo, beans, tomato, onion, cheese, and sour cream. (Half order 8.95) Tostones with shredded beef cooked with bay leaves and tomato, with strips of red and green bell peppers, white and green onions, seasoned with garlic and rosemary. Topped with avocado dressing. (Half order 6.95) Steamed sweet peppers filled with Spanish chorizo, a bit of corn, and green onions. Served over a mild red pepper sauce & topped with melted mozzarella cheese. Served over rice. (Half order 5.95) Sweet plantain topped with caramelized hibiscus infused with red wine, balsamic, and sprinkled with fresh Mexican cheese. Garnished with cilantro and red pepper. Half Order 7.95, Skewers that get their name from the barbed darts used during a bull fight! Made with chicken, or cheese, with zucchini squash and roasted peppers, infused with a mango vinaigrette. Served with rice. Our most popular flavors. Chicken enchilada roja, cheese enchilada verde, chicken enchilada with bean sauce, and cheese enchilada with a rich mole sauce. Topped with cabbage, onion, tomato, cheese, and sour cream (contains peanuts and sesame seeds). Grilled wild salmon filet smothered in an avocado-cilantro glaze with bell peppers, green, and red onions. Complex, creamy, tart, and extremely fresh; it is blatantly obvious Chef Nora has made this dish with love. Served with rice and cabbage salad. A healthy, low fat vegetarian black bean soup with tomatoes, onions. A combination of vegetable broth and sweet plantain puree sets a great stage for the fresh green onion, cilantro, and chunky plantains. Cucumbers, onions, apples, and queso blanco. Topped with a great combination made of a balsamic glaze and fresh avocado dressing. Served on organic, vegan brioche bread and a side of tostones and a delicious mango dipping sauce. Savory shredded chicken with roasted red peppers, onions, and poblano peppers. Topped with fresh avocado and provolone cheese. Lightly covered with a vibrant chipotle dressing. Served on organic, vegan brioche bread and a side of tostones and a delicious mango dipping sauce. Served in traditional style with pork, ham, mustard, pickles and provolone cheese. Served on organic, vegan brioche bread and a side of tostones and a delicious mango dipping sauce. Sliced turkey, sweet plantains, queso blanco, white onions, and green onions. Lightly covered with a delicious Costa Rican Lizano glaze. Served on organic, vegan brioche bread and a side of tostones and a delicious mango dipping sauce. Crispy corn tortilla strips in a tomato-based Mexican soup with vegetable stock, chile ancho mild pepper, and cheese. A recipe has no soul, a Chef must bring soul to it. Shredded beef cooked with tomato puree, rosemary & bay leaves with strips of red and green bell peppers & onions. Topped with bean sauce. Served with rice and tostones. A cake made of fried Mexican cheese, layered with sweet plantains, quinoa and a mixture of grilled onions and zucchini. Garnished with red pepper sauce, pesto and sun dried tomatoes, sprinkled with fresh cilantro. Grilled chicken breast served over a thick slice of cucumber, covered in a modern take on gazpacho consisting of onion, and cilantro with chopped cucumber and red pepper, bathed in avocado sauce with a splash of olive oil and orange juice. Served over a bed of rice. Half Order 6.95, What we are most famous for! Corn tacos filled with heavenly hibiscus flower, which is rich in vitamin C and minerals, accompanied by green and Spanish onions, cilantro, garlic, and mozzarella cheese, then topped with red pepper sauce. A combination of flavors that would make even the harshest food critic blush. A bed of crispy yucca, strips of tender juicy sirloin, and caramelized red onion covered in a creamy white wine sauce, then topped with an ancho pepper stuffed with Spanish chorizo and refried black beans. Simply, a smart and asserted combination of flavors!! Three enchiladas filled with chicken covered in our homemade mole sauce, oven baked, and topped with onions, cilantro, cheese, and sour cream. Served over a bed of rice (contains peanuts and sesame seeds). Wild Salmon on a bed of red pepper rice in a wonderful chipotle glaze, topped with savory and sweet mango chutney and garnished with fresh cilantro and crispy onions. This fire roasted poblano pepper stuffed with a steamed tamale (pork or beef) is the perfect marriage of two classic dishes. Served with rice and cabbage salad. Romaine lettuce, spring mix, grilled carrots, corn, zucchini, cheese, onions, and almonds. Topped with a grilled salmon filet smothered in an avocado-cilantro glaze with a light touch of Spanish vinaigrette. Sauteed ripe plantains and refried beans wrapped in three corn tortillas and smothered in a rich mole sauce. Served over a bed of rice and topped with sesame seeds and sour cream. What we are most famous for! Corn tacos filled with heavenly hibiscus flower, which is rich in vitamin C and minerals, accompanied by green and Spanish onions, cilantro, garlic, and mozzarella cheese, then topped with red pepper sauce. A combination of flavors that would make even the harshest food critic blush. Small filet of fish paired with our finest herbs in union with an insatiable blend of red onions, grilled zucchini, garlic and pineapple that rest atop a bed of refried black bean spread. Cooked inside a corn husk for maximum flavor. For anyone who fell in love with our fish tacos. Three enchiladas filled with fish and smothered with chile serrano cheese sauce. Served over a bed of beans. Tapas are a variety of appetizers or smaller meals. They may be cold or hot. Tapas have evolved into an entire, and sophisticated cuisine. Patrons of tapas may order many different tapas to share or combine them to make a full meal. The serving of tapas is designed to encourage conversation because people are not so focused upon eating an entire meal that is set before them. Arepas topped with shredded pork carnitas and spring mix, drizzled with creamy avocado dressing with a sprinkle of sun dried tomatoes and fresh queso blanco. Fresh grilled marinated fish or shrimp on a bed of sautéed onions, bell peppers, and pineapple with melted cheese. Served with corn tortillas, and guacamole on the side. Tostones with shredded beef cooked with bay leaves and tomato, with strips of red and green bell peppers, white and green onions, seasoned with garlic and rosemary. Topped with avocado dressing. Steamed sweet peppers filled with Spanish chorizo, a bit of corn, and green onions. Served over a mild red pepper sauce & topped with melted mozzarella cheese. Served over rice. A delicious combination of our most popular flavors. Chicken enchilada roja, cheese enchilada verde, chicken enchilada with bean sauce, and cheese enchilada with Chef Nora’s rich mole sauce. Topped with cabbage, onion, tomato, cheese and sour cream. Sides of guacamole dip, chile con queso dip and your choice of salsa. Served with baked tortilla chips. Fresh avocado dip made with tomatoes, onions, and cilantro. Served with baked tortilla chips. Melted cheese with fresh roasted serrano and anaheim chiles. Served with baked tortilla chips. Homemade empanadas stuffed with your choice of chorizo, chicken, or cheese topped with our homemade chile con queso sauce. Mix of rice, mozzarella cheese and tender chicken formed into four balls over a bed of mole sauce, topped with a bit of cilantro. A unique combination of chayote squash, zucchini, and yellow squash with caramelized red onions, green peppers, red peppers and cheese. Served with corn tortillas, and guacamole on the side. Enjoy delicious grilled marinated shrimp on a bed of sautéed onions, bell peppers, and pineapple with melted cheese. Served with corn tortillas, and guacamole on the side. Fresh grilled marinated fish on a bed of sautéed tomatoes and onions. Served with corn tortillas, and guacamole on the side. Enjoy grilled marinated chicken or steak on a bed of sautéed onions, bell peppers, and pineapple with melted cheese. Served with corn tortillas, and guacamole on the side. Fresh avocados filled with Chef Nora’s red, black and garbanzo bean salad infused with a unique tangy vinaigrette. order of 6 ($11.95), order of 10 ($15.95) Delicious cornmeal patties topped with chorizo, beans, tomato, onion, cheese, and sour cream. 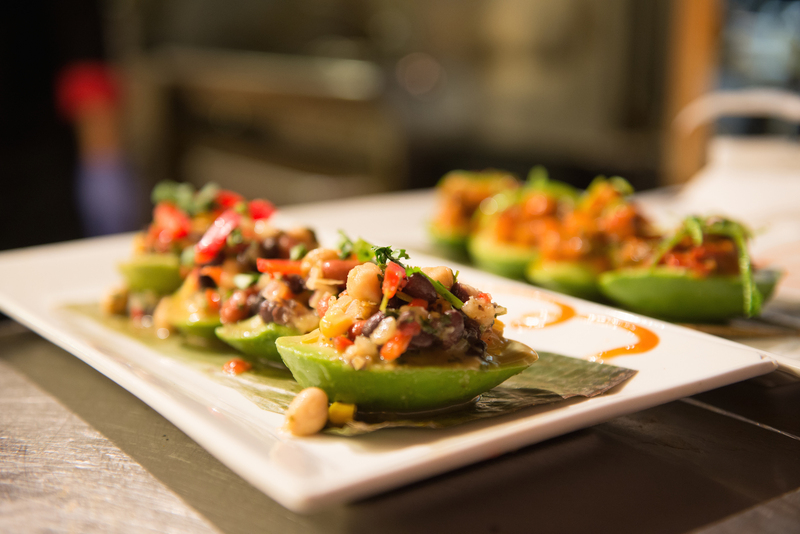 Fresh avocado filled with lime infused shrimp and red onion, then covered in a delicate citrus glaze and topped with fresh cilantro. Sweet plantain topped with caramelized hibiscus infused with red wine, balsamic, and sprinkled with fresh Mexican cheese. Garnished with cilantro and red pepper. Popular skewers get their name from the barbed darts used during a bull fight! Made with chicken, or cheese, with zucchini squash and roasted peppers, infused with a tangy mango vinaigrette. 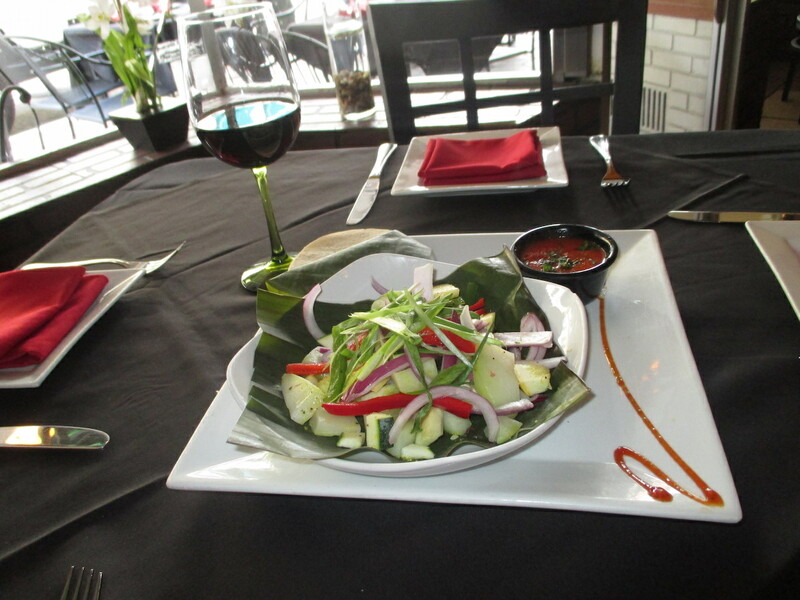 De La Vega's Vegan Menu is perfect for the health conscious foodie looking for more flavor in vegan options. 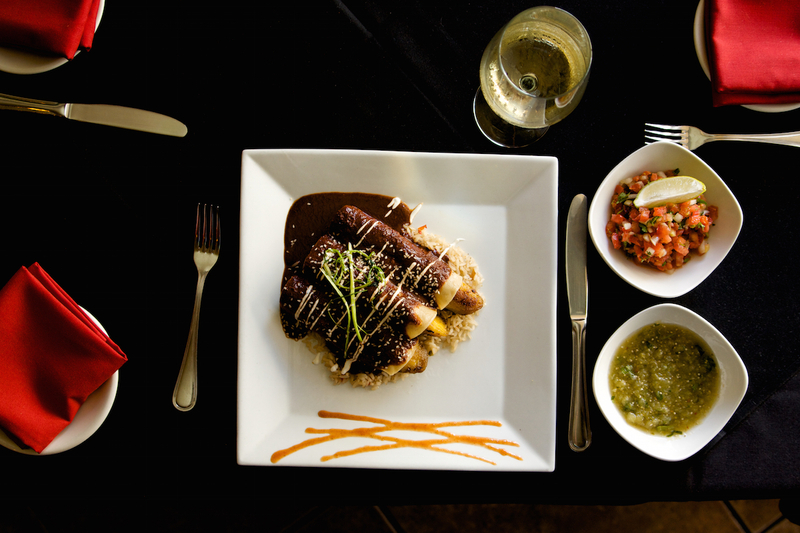 Sauteed ripe plantains and refried beans wrapped in three corn tortillas and smothered in a rich mole sauce. Served over a bed of rice and topped with sesame seeds. A combination of grilled zucchini on a bed of sautéed onions, bell peppers, and pineapple with melted cheese. Served with corn tortillas, and guacamole on the side. Sweet plantain cups with caramelized hibiscus infused with red wine, balsamic. Garnished with cilantro and red pepper. Fresh avocados filled with Chef Nora’s red, black and garbanzo bean salad infused with a unique tangy mango vinaigrette. Fresh avocado dip made with tomatoes, onions, and cilantro served with baked tortilla chips. Order of: 6 ($8), 10 ($15); What we are most famous for! Small corn dough patties topped with beans, tomato and onion. Two enchiladas filled with refried black beans, topped with Chef Nora’s flavorful red pepper sauce, cabbage, onion, cilantro, and tomato. Served with Gallo Pinto.